These pages are devoted to the parish of Bilyi Kamin (Білий Камінь) / Biały Kamień . Most of my mother's family originated from this parish, which is located today in Ukraine, in the district of Zolochiv (Золочів) / Złoczów. It is located about 60 kilometers east of the large city of Lviv (Львів) / Lwów. Before the end of World War II when most of the ethnic Poles were resettled to what is today western Poland, the parish had a large Polish and Roman Catholic minority. Today, the population is almost entirely Ukrainian and Greek Catholic (also known as Ukrainian Catholic). Gazetteer Information on the parish. Here are extracts of each gazetteer pertaining to villages in the parish of Bilyi Kamin / Bialy Kamien. These can be used as examples of what each gazetteer offers. Parish Information as found in Gemeindelexikon der im Reichsrate vertretenen Königreiche und Länder. Volume 10: Galizien (Galicia). Vienna, 1907. This information is taken from the incredible Jewish Genealogical website www.jewishgen.org. Among the many diverse databases is this one-the 1929 Polish Business Directory, which lists thousands of cities, towns and villages. 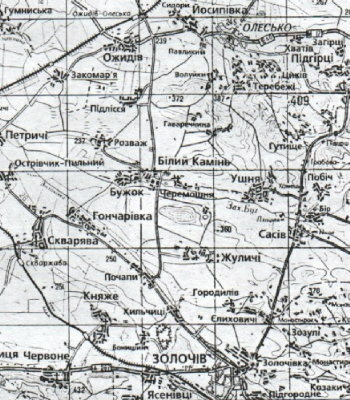 The Jewishgen site states: "The Polish Business Directories of the 1920s and 1930s have thousands of pages of information about people in current and former areas of Poland, including regions now part of the Vilna area of Lithuania, the Grodno area of Belarus, and Volhynia and East Galicia, now parts of the western Ukraine." I encourage you all to visit their site! Gazeta Powiatowa - Wiadomości Oławskie (online newspaper from Oława, a county/district southeast of Wrocław in southwest Poland) Many Poles from Złoczów were resettled to Oława. There are often historic and cultural articles about the Resettlement, current ties to the Zolochiv / Złoczów region in Ukraine.